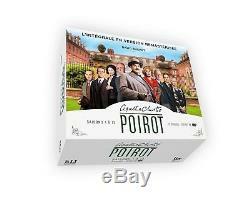 Dvd - hercule poirot - the complete seasons 1 to 13. Shipping from France under 24 / 48h. Product description Product description contains: - "agatha christie: poirot - season 1" - "agatha christie: poirot - season 2" - "agatha christie: poirot - season 3" - "agatha christie: poirot - season 4" - " agatha christie: poirot - season 5 "-" agatha christie: poirot - season 6 "-" agatha christie: poirot - seasons 7 & 8 "-" agatha christie: poirot - season 9 "-" agatha christie: poirot - season 10 " - "agatha christie: poirot - season 11" - "agatha christie: poirot - season 12" - "agatha christie: poirot - season 13" synopsis find Hercule Poirot, the well-known Belgian detective, with the perfect mustache he is so proud of Savor the joviality, the wit and the intelligence of an outstanding detective. Police officer retired and exiled in England following the ravages of the First World War, he quickly asserts himself as an excellent private detective ... Actors: david suchet, hugh fraser, philip jackson, Pauline Moran directors: edward bennett, renny rye , tom clegg, paul unwin, david moore format: color, pal audio: english (dolby digital 2.0), french (dolby digital 2.0) subtitles: french region: region 2 this dvd probably can not be viewed outside the box 'Europe. Number of discs: 49 studio: elephant films DVD release date: October 5, 2015 Running time: 4996 minutes. The item "dvd hercules poirot full seasons 1 to 13" is on sale since Thursday, September 28, 2017. It is in the category "dvd, cinema \ dvd, blu-ray". The seller is "around_the_clock" and is located in /leans. This item can be shipped to the following country: europe.